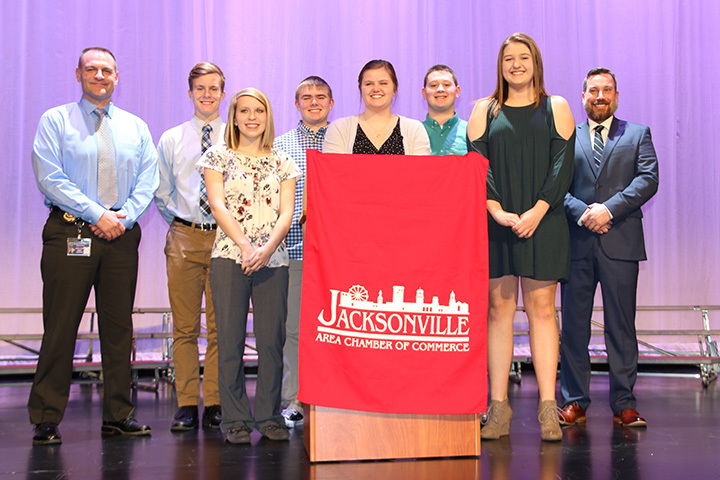 The Jacksonville Area Chamber of Commerce hosted the Mayors’ Student Volunteer Awards Ceremony on Wednesday, March 21 at the Jacksonville Middle School Auditorium. Eighteen local students received awards for their volunteer service hours performed during 2017. Over 3,200 hours of service were logged by these students at a variety of businesses, churches and organizations throughout the year. Andrea McCombs served as a speaker for the event. Mayor Andy Ezard and Village President Harry Jennings were on hand to present the awards to the students. The Mayors’ Student Volunteer award is an annual award given to students aged 5-21 who have given at least 75 hours of service. Students are also awarded President’s Volunteer Service Awards from the national award program based on their age and number of hours of service. This year’s recipients include: Camri Anderson, Anne Becker, Laura Cannon, Sarah Christian, Kyle Colwell, Avery Dugan, Ashley Fry, Maysel Gibson, Will Gibson, Meadow Hawkins, Bethany Pohlman, Abby Schumacher, Adam Schumacher, Ellinor Smith, Jennifer Smith, Megan Suttles, Amelia Symons, and Liddy Weber. The Jacksonville Area Chamber of Commerce congratulates these fine young people on their service to our community.